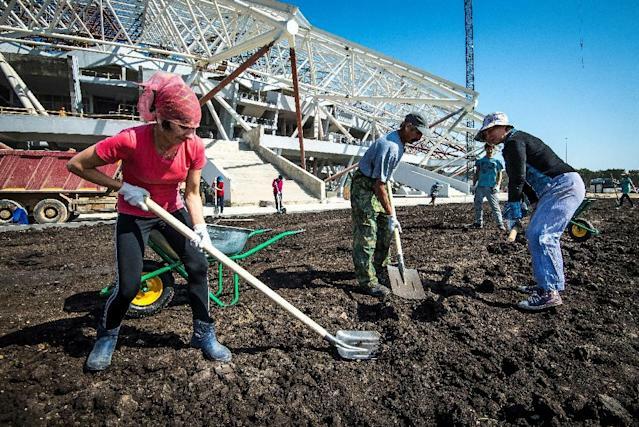 Moscow (Russia) (AFP) - Russia's perpetually late World Cup stadium in Samara had some good news to report exactly two months before kickoff: it is finally getting its grass. Twelve gleaming white lorries filled with rolls of the precious pitch arrived Saturday in the Volga River city from Germany. Photographs proudly tweeted by the regional administration also showed nine construction crane-type objects identified as "artificial suns" stationed outside the stadium. They will be suspended a few feet above the pitch once the grass is rolled out and start shining as much light as possible so that everything sticks in place. "The nine 'artificial suns' will warm up the grass so that it gets accustomed to Samara's soil as quickly as possible," the administration said. How long that takes will go a long way in deciding whether Russia has a big mess on its hands when the games begin on June 14. Russia is sparing no expense as it prepares to host the international football extravaganza at the height of a new spike in diplomatic hostilities with the West. More than $13 billion (10.5 billion euros) are officially going into stadium construction and refurbishments for the 11 host cities. Each is getting a new or refurbished airport and repaved roads. Hotels are being built in places few foreign visitors ever venture. The first World Cup to reach the former Soviet Union is meant to show off Russia's might at every turn. But details, like the absence of grass at one of the arenas, threaten to scuttle those plans. Samara has been plagued by problems since construction began four years ago. Developers had to abandon plans to build a glass dome that looked like a flying saucer because it simply cost too much. The time it took to come up with a more budget-friendly alternative delayed development by nearly six months. The government filed a lawsuit -- one of four against stadium builders across Russia -- over the delay. The plan for the fancy German grass was drafted in the halcyon days when time was not an issue. The green stuff was meant to arrive before the Russian winter and take root during spring. But the stadium was not ready and there was no turning back by the time one the coldest Januaries on record stalled construction for another three months. Workers will be hoping that the heating lamps work well enough to make the pitch playable by the first test game on April 28. Samara is due to host its first World Cup match when Coast Rica and Serbia play on June 17.